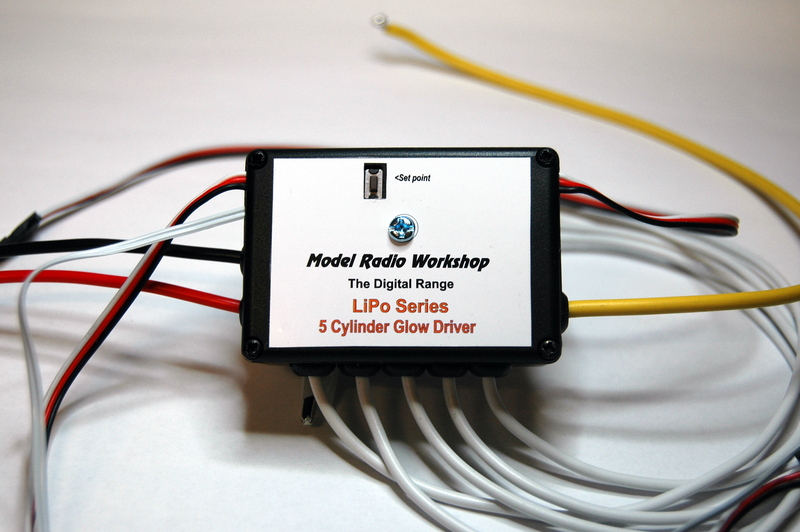 The Five-Cylinder Glow Driver operates 5 glow plugs independently using a single cell LiPo or 3 cell NimH battery. The switch-on point is programmable and the unit will automatically turn the plug off below tick over. The unit comes with a glow plug connector etc and it has a remote status L.E.D to show when the plug is powered. A “Y” harness is not needed as a feed through throttle servo lead is integrated into the unit. The glow plug is enabled between the user selected tick-over and set point positions. The operating points can be anywhere on the stick travel. The LED lights to confirm set-up. 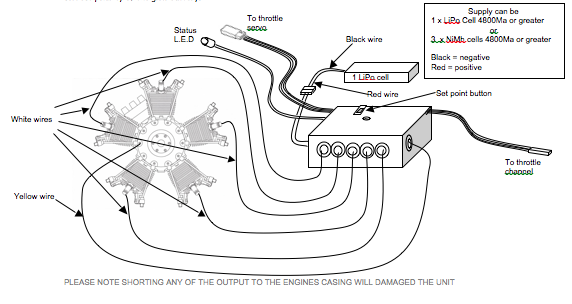 The LED lights when glow plugs are active. The LED flashes and glow plugs are inhibited when the LiPo battery voltage is below 3.3 volts. A single cell LiPo cell is used to power the glow plugs or 3 cells of NiMh. Move the throttle stick to the tick-over position and press and hold the set button. The LED glows to confirm that the tick-over position has been stored. If the LED is already glowing (because of a previous setting) when the button is pressed, the LED will blink out before glowing to confirm that set-up is active. Move the throttle stick to the position where you would like the glow plug to activate. (About one eighth throttle is a good starting point.) Release the button. The LED goes out to confirm that the set-up is complete. LiPo batteries must be treated with respect. Please disconnect the LiPo battery from the unit when storing the model. The LiPo Glow Driver is intended for use with a single LiPo cell of 4.2 volts. Do not use higher voltage LiPo packs.